A pair of college students takes a weekend job at a country estate in rural England translating old films from Mandarin into English. The mansion where they are staying houses a mysterious past that the family who owns it may not want to be discovered. There is a fine line between "slow-burning tension" and "slow, boring, and tedious." "Susu" is the feature film debut of writer/director Yixi Sun. The story revolves around a college student named Qi'an (Zitong Wu) and her roommate Aimo (Zhu Lin), who live in London. They have recently gotten an offer for a weekend job at a country estate in rural England where they will be translating some old films featuring Kunqu Opera star Susu (Junjie Mao) from Mandarin into English. Susu used to be the lady of the house up until the time of her suicide 28 years ago. The residence now belongs to her son Benjamin Stewart (Frederick Szkoda) and Susu's sister-in-law Shirley (Steve Edwin). Also at the house the same weekend is a biographer named Joia (Roslyn Hill), who is writing a book on Susu's life and work. When Joia discovers something she isn't supposed to find, it kicks off a deadly string of events that Qi'an and Aimo get pulled into and may put their lives in danger. 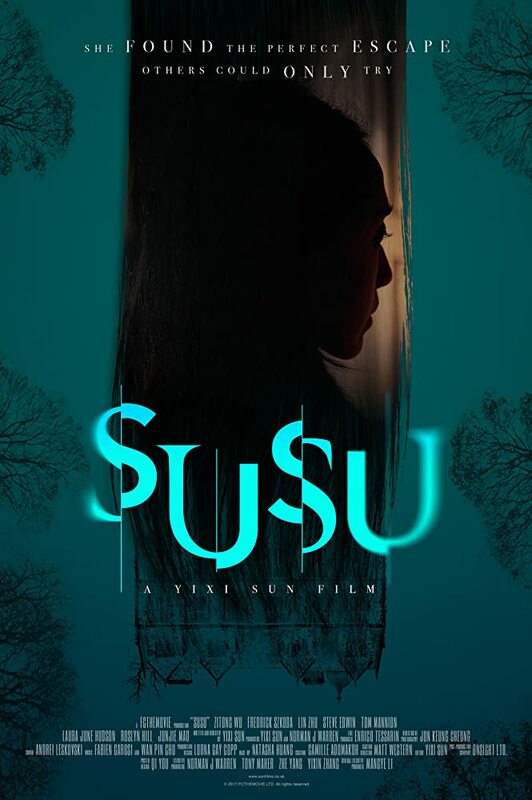 "Susu" is a very slow-burning gothic style dramatic horror film that is beautifully shot. There is a wonderful, creepy aesthetic throughout the movie that makes it visually compelling. It takes place in an old-timey English mansion full of interesting architecture, obscure paintings, and small artistic details. It's a nice film to look at, and it's obvious that director Yixi Sun had a specific vision that she and cinematographer Jun Keung Cheung managed to capture well. We wish we could say that the story is as interesting as the visuals. For us, the narrative doesn't make much sense. The story meanders on for far too long, and even when its true intentions are revealed, there was still at least half an hour left to explain everything in painstaking detail. We understand that Sun is trying to make a methodically paced dramatic horror, so she's trying to bring about the proper atmosphere and tension, but apart from one or two fleeting instances, we never really felt the stress and anxiety we should feel in situations like the ones Qi'an and Aimo go through during their weekend job. It feels like Sun is attempting to weave a complex mystery with many twists and turns that don't ever feel shocking or twisting because we figured the details out early on in its runtime. "Susu" keeps going and going far beyond what feels necessary, leading to a cliche and eye-rolling ending that was absolutely ridiculous, in our opinion. The pay off is nowhere near worth the wait. Another issue we have with this movie is a plot point involving a transgendered person who really isn't transgendered. This individual is ultimately seen as mentally ill. This didn't sit well with us, and while it isn't what hurts the film overall, it was hard to ignore our strong feelings about how tacky it was, especially considering it feels so unnecessary to the story as a whole. There is something to be said for learning what's important for your characters and what's important for the narrative of your story while leaving out anything else that isn't integral to the film. So much of what winds up on screen in "Susu" feels superfluous and all over the place, and certain elements and characters feel irrelevant. In the end, despite being extremely visually striking, this movie didn't have enough story to fill its runtime. It's all flash without much substance. We really wanted to like "Susu," but we never got invested in the characters, which left us feeling a bit "meh" about it overall. Still, we can't wait to see what Yixi Sun does next since she clearly has a great visual style.